Dicomano lies 40 km. north-east of Firenze. 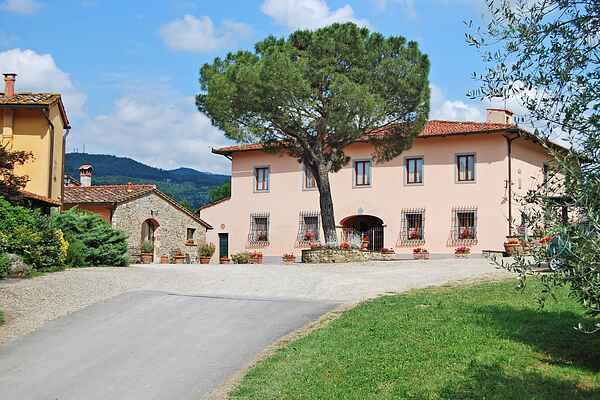 This agriturismo is a house which has been recently restored and rebuilt into four beautiful apartments. This agriturismo is situated in the outskirts of the village Dicomano. Because the house is surrounded by the wonderful valleys of Florence with forests and olive plantations, it offers a magnificent view with a delicious climate. The apartments all have a garden with chairs, table, parasol and barbeque. You have access to a communal panoramic swimming pool which offers a view at the valleys. In order to nicely sun bath, there are tables and lounge chairs at the swimming pool at your disposal. Furthermore the agriturismo also has a communal billiards hall. You can use the covered parking place for free. You can bring small animals on request and against payment of 5,- per night. A Dicomano there are various events throughout the year. Every third Sunday of the month there's an exhibition-craft market, used and antique; in May instead there is a livestock show with agriculture and handicrafts; in July you will find the Archaeological Nights and Etruscan Dinner; Finally in September the Rificolona: a parade of floats and challenges between the various neighborhoods. Also in the neighboring towns there are various events in which to participate, for example, in the Park of Villa Demidoff in Pratolino, or for over a decade in May the feast of the Florentine countryside and rural life; interesting also the Fair Mugellana Agricola in Borgo San Lorenzo and San Lorenzo Craft Show with skin craftsmen and ceramics, tasting of typical products and much more.